CrushClans is a questionable and potentially risky Google Chrome browser extension that may show up in your browser under questionable circumstances. In all fairness, we must mention that it is also possible that you actually install this tool knowingly from official sources, but this does not make it any more reliable. In fact, we have classified this application as an ad-supported program or adware. This annoying program can spy on you and also display potentially unreliable third-party ads while you are surfing or searching the web. These ads could expose you to harmful third-party web content and you might get scammed and lose money or infect your computer with more threats. 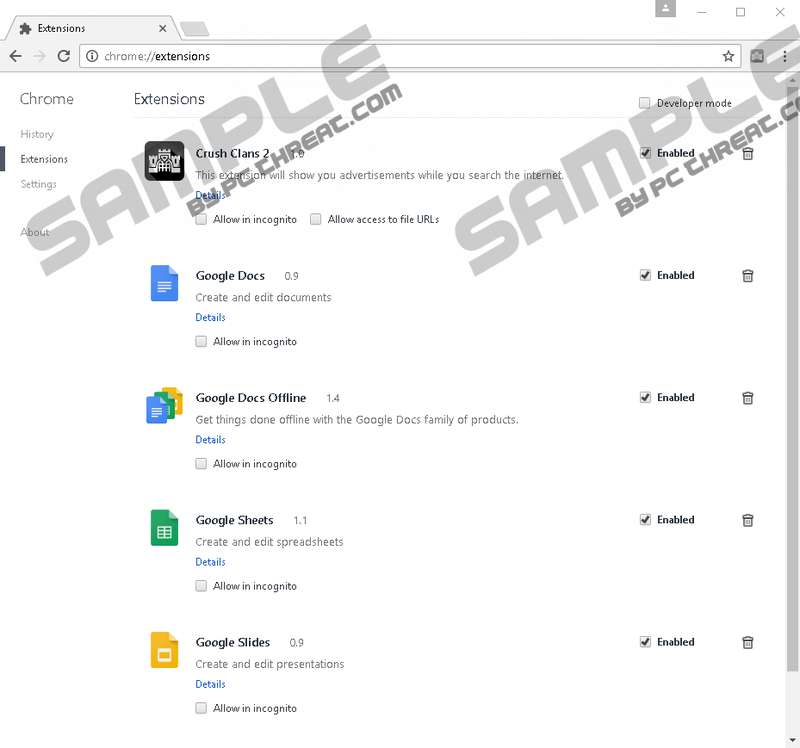 Since this adware can infiltrate your computer bundled with other malware infections, you should not waste any more time to act. We recommend that you remove CrushClans right away and identify all other possible threat sources as well to restore order on your system. Most users would simply ignore this list and rush to click on the “Add extension” button. But are you sure you are going to be safe after giving such rights to an advertising supported program? This adware is also available in the Chrome web store at chrome.google.com/webstore/detail/crush-clans-2/icmblmficbgmimjahkgbgjdfnfopgafn. Here its true function is revealed: “This extension will show you advertisements while you search the internet.” It seems that so far only one user has installed this tool, which is not really promising. If you are the one, we advise you to delete CrushClans right now. The worse case is when you install this useless adware from a freeware bundle that could be packed with several more malicious software installers, such as browser hijackers, keyloggers, fake alerts, and other ad-supported programs as well. Installing such a malicious bundle is usually possible after you click on harmful third-party advertisements. These ads may not even look like real commercials because schemers may disguise them as important system notifications or fake buttons on questionable webpages. If your system was clean before and no adware was present to show you such unreliable ads, it is possible that you visit a suspicious torrent or freeware site and this is how you are exposed to such contents. All in all, we suggest that you delete CrushClans and run a reliable malware scanner right afterwards. This browser extension has no beneficial functions for you. In fact, the only benefit is reaped by the creators since this application’s main goal is to generate income through third-party advertising and driving web traffic to affiliated websites. This is why you may experience annoying third-party ads and sponsored links while searching the web. However, not only are these annoying but also potentially unreliable. One click on the wrong content and you could drop a dangerous infection onto your system or end up on a malicious website sharing your banking details with cyber criminals without even realizing it. This is why we recommend that you remove CrushClans as soon as possible. 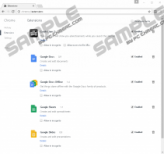 The only good thing we can mention about this browser extension is that you can very easily delete it from your Google Chrome browser. Open your Settings menu and in the Extensions section simply remove the extension. Please use our guide below if you need help with this. As you can see, it is quite easy to infect your system with adware and other infections. Since it is also possible to let even more dangerous infections on board, such as ransomware programs, just by clicking on the wrong content or opening a spam e-mail, we suggest that you employ a reliable anti-malware program, such as SpyHunter. This security software can automatically protect your system 24/7 from all the known malware infections. And, you can just sit back and relax while browsing the web all protected. Locate the extension called “Crush Clans 2” and click on the trash can icon on the right. Quick & tested solution for CrushClans removal.